These are a few meshes that have been sitting in my pc for almost two years......I kid you not. Slaved to the Emma dining room I hope I can wrap this up once and for all and make it available to those of you who still enjoy Sims 2. Thanks for sharing! They are great! Thanks so much Nat!! I love it! Thank you so much! Theres many of us that still enjoy TS2 :) This bedroom looks great, I love it. Thankyou Nat, it looks real good, big hugs judith. Thank you very much! It looks lovely. There are plenty of people who still love Sims 2 love your work! Nat, your sets are always incredible! Thankyou. 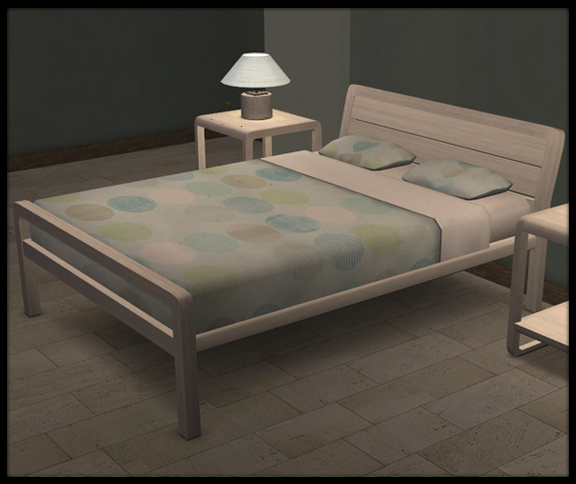 I remember starting this and wanting to make a teen room but so much got in the way. I dislike uploading things that I feel are incomplete. At the same time I guess it is better to share what I did make rather than no one enjoying it at all. This is loverly. I adore the clean, elegant lines of the headboard especially. Kudos! Please note - I couldn't work out how to turn it into a hyperlink, so copy the link and paste it into the address field, or if you're on firefox select the link and right-click choose "open in new tab"